Today, we’re excited to announce the first four startups that we will be investing in and working with as part of the dLab/EMURGO program, a 14-week program designed to accelerate the development of these companies. It’s been an extremely competitive selection process, as we’ve received far more applications than expected for an inaugural program, and it’s truly been a pleasure to speak with so many passionate founders who are working day and night to decentralize the world’s data, empower individuals, tokenize financial instruments, and explore new use cases for blockchain technology. After hours of interviews and internal discussions, these four companies proved to us that they have what it takes to become great. Thank you to everyone who has applied! In addition to the four companies which are participating in the first dLab/EMURGO cohort, we’re also funding several Cardano fellowship projects. Fellows will work closely with our staff, selected startups and our partners to develop novel concepts for research, open source, education, and productization. We’ll be releasing details about these projects in the coming weeks on our blog, so keep an eye out! Both SOSV and EMURGO will be spending the next 14 weeks working hand in hand with these founders to accelerate their companies’ technology, business models, and positioning. In addition to investment, we’ll be providing them with staff support, network access, and opportunities to work closely with our large, diverse mentorship pool. Catallact is a blockchain analytics engine for the finance industry, focusing on market intelligence and regulatory compliance. Built upon extensive academic research by founders that have significant trading experience, Catallact applies machine learning and data science techniques to provide automated and scalable insights into the dynamics of crypto-assets. Helixworks’ proprietary MoSS technology integrates DNA-based ID tags to physical goods. When combined with digital ledger technologies, DNA-IDs provide an effective mechanism to track food, medicine and other supply chain goods that is secure, robust (surviving washing, extensive damage, etc), and extremely difficult to falsify. Sempo helps aid organizations distribute relief funds directly to people in crises so that they can immediately buy what they need. They solve beneficiary enrollment, cash disbursement and program monitoring in one seamless platform. Tesseract is standardizing and streamlining the way applications interact with blockchains to make it as convenient as interacting with the Internet. Their multi-network OpenWallet protocol, mobile-first wallet reference implementation, and supporting SDKs for mobile application development are their first step towards building the railway for decentralized internet. dLab is a New York City-based accelerator which focuses on distributed ledger technologies including DLT protocols, blockchain infrastructure, decentralized applications, and distributed ledger technologies. 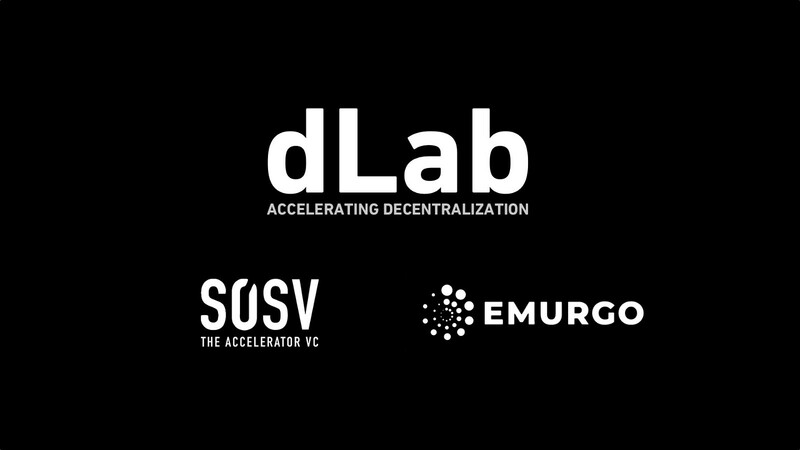 dLab combines EMURGO’s deep expertise in commercial blockchain development and the robust strength of the Cardano ecosystem, with SOSV’s best-in-class acceleration processes, investment consortium, and ability to help companies bring innovative technologies to market rapidly. The program is designed to be protocol agnostic and multi-disciplinary, and accelerated startups may be focused on any variant of distributed ledger or blockchain technologies. EMURGO’s partnership means that startups building for the Cardano ecosystem receive several material advantages, including access to Cardano development and policy partners. EMURGO drives the adoption of Cardano and adds value to ADA holders by building, investing in, and advising projects or organizations that adopt Cardano’s decentralized blockchain ecosystem. EMURGO leverages its expertise in blockchain R&D as well as its global network of related blockchain and industry partners to support ventures globally. EMURGO is the official commercial and venture arm of the Cardano project, registered in Tokyo, Japan since June 2017 and in Singapore since May 2018. EMURGO is uniquely affiliated and works closely with IOHK to grow Cardano’s ecosystem globally and promote the adoption of the Cardano blockchain. SOSV, the “Accelerator VC”, deploys more than $50m each year to the 150 startups and alumni that graduate their deep-tech accelerators in hardware (HAX), life sciences (IndieBio/RebelBio), cross-border internet (Chinaccelerator/MOX), and disruptive food (Food-X). Every year an additional $250m in follow-on capital is invested into SOSV startups by a broad investment network of over 200 VCs and corporates globally. SOSV startups have aggregate revenues of more than $1B and a combined market capitalization of over $10B. Thanks to Nick Plante and Isabella Fantini. Program Manager for dLab. Enjoys cooking, reading, and playing soccer. Passionate about learning, thinking critically and helping others.